Find out how to tell an American bear from a Russian one! Now that bears have become part of the debate in the U.S. presidential election, it’s important to know what makes the two subspecies distinct. "There’s an old proverb that says the Russian bear never dies, it just hibernates” — at least according to U.S. Republican vice-presidential candidate Mike Pence, who made the statement during his debate with Democratic vice presidential nominee Tim Kaine on Oct. 4. The next day, Russian Foreign Ministry spokeswoman Maria Zakharova recounted Pence's joke on her Facebook page, and included a comment of her own. "I'd add – in contrast to the grizzly," Zakharova wrote. The grizzly bear (Ursos actos horribilis) is a subspecies of the brown bear (Ursus arctos), which is close to the East Siberian subspecies of the brown bear (Ursus arctos collaris). In the U.S., grizzlies live mainly in Alaska, as well as in Montana and Wyoming, mostly around the Yellowstone-Teton area. The East Siberian brown bear inhabits almost the entire Russian forest zone, except for its southern regions. Grizzlies weigh up to one ton, can reach 13 feet in length and are considered one of the planet's 10 most ferocious animals. The grizzly's hair is long and has a gray tint. Russian bears have short brown-tinged hair, they are smaller and weaker than the grizzly, but nimbler and, according to experts, not so club-footed. Grizzlies have a pretty bad reputation as fearsome predators. In American folklore, grizzlies are responsible for nearly eating Goldilocks and for attacking Leonardo DiCaprio in "The Revenant." In Russian folk tales, bears are considered wise and judicious animals. They are affectionately known as Mishka (a diminutive of the male name Mikhail) and often appear on national symbols. One example of this is the bear that was the symbol of the 1980 Summer Olympics in Moscow. Grizzly bears can have claws up to 6 inches long. The Russian bear's claws are significantly shorter. These claws give a grizzly an opportunity to maul its victim on the fly, whereas the Russian bear can rely only on its teeth. While the Russian bear climbs trees in search of snacks, the grizzly remains dreamily looking at the sky — it is hampered from climbing trees by its long claws and heavy body. 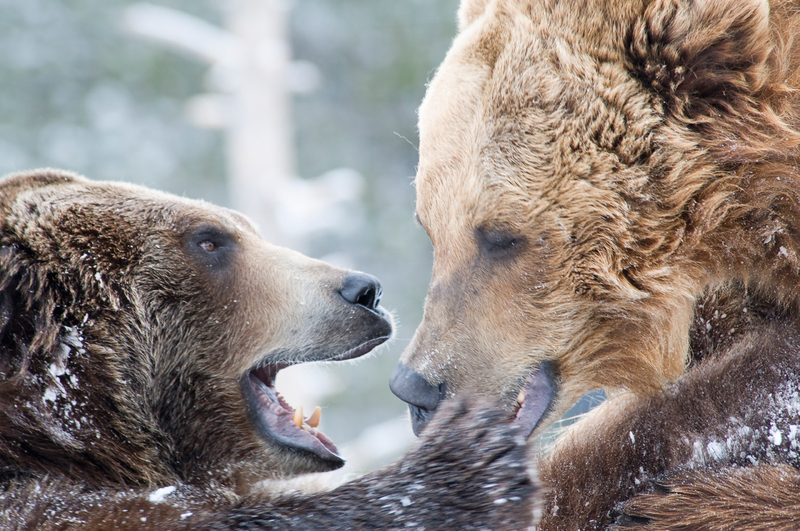 Both grizzlies and Russian bears are omnivorous. Their favorite delicacies are plants, berries, nuts, honey and, of course, freshly caught salmon. Their diets vary only according to different types of plants, nuts and fish available on each continent. The grizzly has a very short tail; the brown bear's tail is longer, but not much. The reason behind this feature is unclear. The political views of both bears are unknown.